Juicing offers a simple way to increase fruits and vegetables in your diet. Many people juice to lose weight, while others juice fruits and vegetables to receive the many nutritional properties they offer. While there are many fruit and vegetable options to choose from for juicing, apples are one of the healthiest and easiest foods to juice. This sweet and nutritious fruit contains numerous health benefits. Juicing apples offers many nutritional benefits. Apples are a good source of antioxidants and flavonoids. In fact, the UC Davis Health System notes that apples and apple juice are particularly high in one of the flavonoids called quercetin. Flavonoids such as quercetin are compounds found in some fruits that have high antioxidant activity, which can minimize oxidative damage to cells that can cause diseases. Apples are also a natural source of Vitamins A and C, along with calcium and potassium. You can also obtain the fiber from an apples skin when juicing with certain high powered blenders. Stanford Medicine notes that your body easily absorbs the nutrients from fruits and vegetables when in a liquid state. The nutrients found in fresh apple juice are associated with various health benefits and the reduced risk of chronic illnesses. For example, Stony Brook University notes that the antioxidants found in apples assist with the cardiovascular system and preventing the onset of certain diseases. Other health benefits of juicing apples include that they are low in calories and contain no fat, cholesterol or sodium. Keep in mind that apple juice made in a conventional juicer may not be a good choice for diabetics or people with blood sugar issues. Unlike many fruits, there’s no need to remove the skin when it comes to juicing apples. 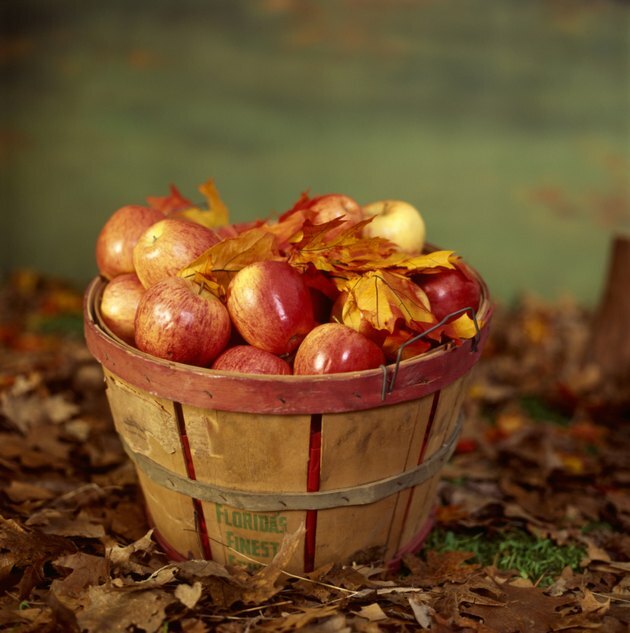 In fact, the skin of apples contains various vitamins and nutrients. While conventional juicers separate the juice from the skin and other parts of the fruit, various super blenders or high power blenders allow you to include the skin and pulp in your juicing concoctions. After cleansing, apples can simply be chopped and placed in a high powered blender to turn the whole fruit into juice including the fiber from the skin. To maximize the health benefits of juicing apples, you should blend apples with other fruits and vegetables. Such combinations as apples and carrots, spinach and apple, or ginger with celery and apple make flavorful drinks and add a variety of nutritional benefits. Spinach, for example, is an excellent source of vitamin K and vitamin A, in the form of beta-carotene. Try out your own apple combinations and see what works best for you.